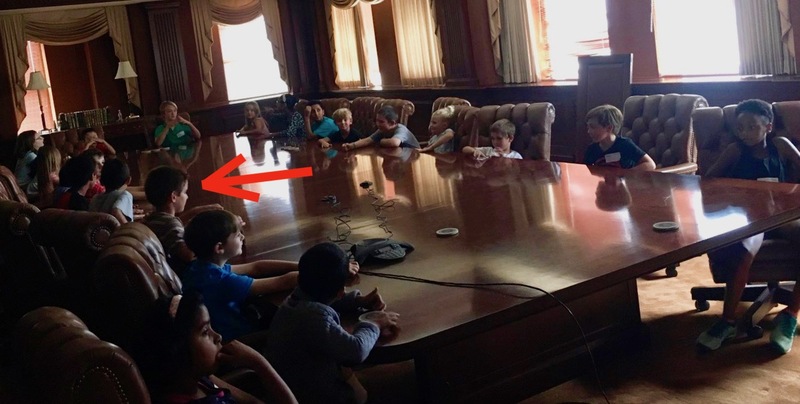 Gabriel and the other kids at “Take Your Child to Work Day” sit around the fancy boardroom table, each pretending to be president. I am going to tell you about when I went to my dad’s work at a company that does computer stuff. When my brother went with him last summer, it was just him and my dad. But when I went, there were other kids with their parents, too. When I first arrived, I sat in a meeting with my dad and then I watched some kids play Settlers of Catan. After that, I played Battleship with another boy. When my dad was on a break, we went to the park and toured an old building, where the elevators were from 1923. There was also a secret elevator a manager let us go on. I think it was an emergency elevator. It was super-cool! After the tour, we got ice cream and then my dad had to work the rest of the day. While he was in meetings and typing and programming at his desk, somebody had brought an Xbox One and we played Fortnite and board games until we left. I think his job is really interesting and his co-workers are nice. I’m happy my dad took me and I had a lot of fun. This entry was posted in Around Town, Gabriel by reba. Bookmark the permalink. Papa and I very much enjoyed your blog. Sounds like your Dad works at a real neat place. I bet you had a lot of fun playing board games and meeting the other kids. However, I think the ice cream treat sounds really great. So sad how I am always thinking about food, especially sweets! Do you think you might like to work someplace similar to where your Dad works?